As I admired the early spring sunset last night, I watched out my front window as a neighborhood dog was unleashed to play for a bit, and began chasing a cottontail rabbit. The rabbit lay nestled under another neighbor’s shrubs, but the dog – not a well-trained Lab but a homely looking mutt – sniffed him out. The rabbit hopped across the yard, and the dog took chase, pursuing the rabbit around that yard, and the next. The rabbit hopped around trees, between bushes and under cars before the dog was called back home. The rabbit was safe, at least for the time being. Scott Russell Sanders, prolific writer and Pulitzer Prize nominee, compared essay writing to “the pursuit of mental rabbits,” what Dinty W. Moore, author of Crafting the Personal Essay, calls a “hunt, a chase, a ramble through thickets of thought, in pursuit of some brief glimmer of fuzzy truth.” Moore retells a scene similar to mine, comparing chasing a rabbit to essay writing. Often, when students are assigned a personal, or narrative essay, their first thoughts are what in the world am I going to write about? followed by how in the world am I going to make it interesting? In memory, I wait beside Eva in the vestibule of the church to play my bit part as father of the bride. She hooks a hand on my elbow while three bridesmaids fuss over her, fixing the gauzy veil, spreading the long ivory train of her gown, tucking into her bun a loose strand of hair, which glows the color of honey filled with sunlight. Clumsy in my rented patent leather shoes and stiff black tuxedo, I stand among these gorgeous women like a crow among doves. I realize they’re gorgeous not because they carry bouquets or wear silk dresses, but because the festival of marriage has slowed time down until any fool can see their glory. Pardon my cosmic metaphor, but I can’t help thinking of the physicists’ claim that, if we trace the universe back to its origins in the Big Bang, we find the multiplicity of things fusing into greater and greater simplicity, until at the moment of creation itself there is only pure undifferentiated energy. Without being able to check their equations, I think the physicists are right. I believe the energy they speak of is holy, by which I mean it is the closest we can come with our instruments to measuring the strength of God. I also believe this primal energy continues to feed us, directly through the goods of creation, and indirectly through the experience of beauty. The thrill of beauty is what entranced me as I stood with Eva’s hand hooked over my arm while the wedding march played, as it entrances me on these September nights when I walk over dewy grass among the songs of crickets and stare at the Milky Way. How did Sanders go from a wedding to the Big Bang, to creation, to God, to the Milky Way? Chasing mental rabbits. 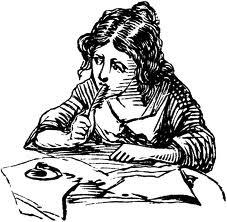 Have you ever tried to write a narrative essay and focus your attention on one specific event or story? How soon did you lose focus? I’ll guess pretty quick. Mental rabbits. But mental rabbits are worth pursuing. Mental rabbits are where connections to a larger purpose are realized, the “so what?” of the essay uncovered. On these cool September mornings, I’ve been poring over two sets of photographs, those from deep space and those from Eva’s wedding, trying to figure out why such different images–of supernova and shining daughter, of spinning galaxies and trembling bouquets–set up in me the same hum of delight. The feeling is unusually intense for me just now, so soon after the nuptials, but it has never been rare. As far back as I can remember, things seen or heard or smelled, things tasted or touched, have provoked in me an answering vibration. Of course, Sanders is a master of the essay, and he knew if he took off chasing rabbits, he’d better have a good reason. You don’t want to go down a rabbit hole and never come up again. Some may argue that chasing mental rabbits will create an unfocused essay. This might be true if the writer never comes back from the chase, getting lost in the rabbit hole. The idea is to chase the rabbit, but circle back. Connect the dots for the reader. Order will be found in chaos. Think of a childhood memory, nothing dramatic, just a fun, simple memory. When I recall childhood memories, I think of my favorite backyard climbing tree, or swimming in the lake. Describe the event in detail, then, take chase. Pursue your own mental rabbits. Where are they taking you? Why are they important? What is the deeper meaning of this memory? The structure of the personal essay often does not have a traditional narrative arc. It’s a meandering stream of thoughts and connections of an event or moment. If your instructor has assigned a narrative essay requiring a traditional narrative arc, a chronological retelling of events employing a suggested structure, you might have to limit your rabbit chase. The personal essay gives the perception that it lacks a focused structure; however, adept essay writers have honed their craft to make order out of the chaos of their rabbits. For more on the personal essay, read Crafting the Personal Essay: A Guide for Writing and Publishing Creative Nonfiction by Dinty W. Moore. Students come into our Writing Center every day and ask what they can do to improve their writing NOW. Good writing takes time and practice (and lots of reading) but there are a few things you can do immediately to strengthen your writing and wow your instructor before that next essay is due. See what I mean? Cutting that word out will make your writing more concise. But I needed that last one, and this last one too, so make sure it’s not necessary to communicate meaning. A squirrel can go around a tree behind a tree. in a tree. on a tree. toward a tree. under a tree. up a tree. I will stay with the best friend of my sister at the cabin near the river in the valley between the two most beautiful mountains in Wyoming until February despite the weather. Sentences can go on forever with prepositional phrases, and that isn’t a good thing (see how I needed “that” in the previous sentence?). 4. Throw in an absolute phrase. An absolute phrase works to modify an entire sentence. It consists of a noun plus at least one other word, as shown here: The hunters rested for a moment in front of the shack, their breaths white in the frosty air. The first part of the sentence is independent: “The hunters rested for a moment in front of the shack.” The second part of the sentence modifies the first part: “their breaths (noun) white (adjective) in the frosty air (prep. phrase). Throw in some absolute phrases in your narrative essays to make them shine. Bombs were dropped (by who?). Shots were fired (again, by who?). Next time you read the paper, see how many times passive voice is used, and ask yourself if you are getting the whole story. Try these 5 fool-proof techniques with your next assignment and share your results. That was fun! What did I leave out? Any others you want to share? First things first: what exactly are adjectives and adverbs? An adverb is a word that functions as a modifier of a verb, adjective, other adverb, or adverbial phrase, as very in very nice, much as in much more impressive, and quickly as in he ran quickly. They relate to what they modify by indicating place (I promise to be there later), time (Do your homework now! ), manner (She sings beautifully), circumstance (He accidentally dropped the glass when the bell rang), degree (I’m very happy to see you), or cause (I draw, although badly). Many beginning writers throw dressy words into their narrative writing, thinking these words will create better images. But such superficial flourishes often turn out to be colorless and even redundant. Readers must hack away at the cluttered writing to find the point, causing frustration and confusion. When a lion roars, when isn’t it ferociously? When a kitten purrs, isn’t it softly? The robber ran out of the bank quickly. 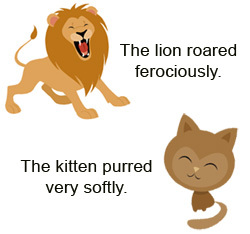 In these two sentences, the verbs (action word) provide the acting and the emotion. The adverbs are merely repeating what the verbs have already communicated. Think about it: is it possible to caress someone without doing it adoringly? Is it possible to run out of a bank without being quick? If the adverb and the verb it modifies are essentially saying the same thing, leave it out. Both of the adverbs above are redundant words that only weaken what they hope to modify. She caressed his face, her hands gliding along the contours of his jaw and along his brow, as if she were reading his face in braille. Wow. Is it hot in here? This description is showing what “adoringly” can’t even envision. Does the laundry list of adjectives add anything to improve the visual? The only thing the adjectives do is create a longer, more awkward sentence. The moon was bright tonight, lighting up the forest, casting a translucent shadow across the evergreens as I walked within the woods. Better? It’s more specific, they sentence is clearer, and it flows better. The moon cast a translucent shadow across the evergreens as I walked within the forest. Best. It’s tighter, flows better, and creates a much more precise image. When in doubt, strike it out. Take the following sentences and eliminate any redundant or unneeded adverbs and adjectives. You may need to incorporate more effective nouns. I walked slowly and methodically through the majestic, lush, green hills, the scent of fresh, spring grass smelled very, very nice. The shiny, new, red Mustang sped hurriedly through the busy intersection, the loud, wailing police siren in quick pursuit. The chef stood lazily over the grill, slowly and wearily flipping the greasy burgers as he carefully balanced the long, gray ash of his cigarette over the dangerously hot stove.